These delicious Gluten-Free & Vegan Almond Coconut Oat Bars are filled with wholesome healthy ingredients, super easy to make and ridiculously tasty! 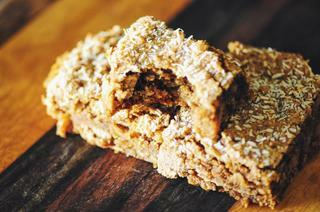 These bars are healthy, hearty, chewy, and amazingly tasty! With an incredible melding of almond & coconut flavors...these bars are so wonderfully satisfying and addictively yummy--even the pickiest of eaters can't put them down. Flour-free, dairy-free, refined sugar-free, egg-free, gluten-free & vegan, these bars are also sure to satisfy the most discerning of diets. If you're looking for a protein and fiber rich snack, a quick breakfast, or a healthy dessert, easy to grab & go--these are it! Preheat oven to 350°F. Line an 8" or 8 x 8 pan or dish, with parchment paper--set aside.In a large mixing bowl, add dry ingredients (except for your 2 tbs extra coconut), stir until combined.In another bowl, add wet ingredients one at a time, whisking until smooth.Combine your wet & dry ingredients, and stir until evenly combined.Using a spatula or your fingers, press your mixture into your parchment lined pan until uniform. Sprinkle with 2 tbs coconut.Bake for 25 minutes, or until all is firm and turning golden.Let cool completely before slicing & serving, and store remainder in an air tight container in fridge. Enjoy!